Philips Hue smart lighting products were big sellers during Black Friday and Cyber Week, but there was one smart light bulb that sold better than any Philips Hue bulb we covered. What’s so special about the MagicLight WiFi Smart Light Bulb, you ask? 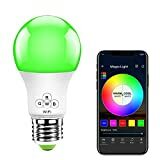 Simple: it packs just about all of the same features as a $50 Philips Hue multicolor LED light bulb, but it only costs $17. It also works with Alexa and Google Assistant without the need for a hub!